may you find encouragement knowing your purpose will feel different and look different for every one else around you. may you no longer compare the dream of your heart to the dreams of others. 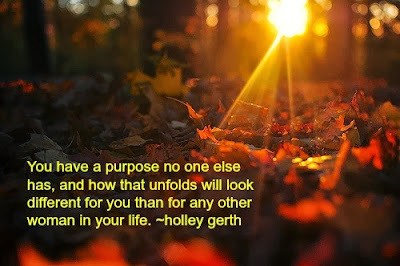 you have been gifted with a unique purpose that only you were created to fulfill. be bold, my friend! come on over to my house tomorrow, where i will share how i tried my best to run away from my commitment to sub in my sunday school class. i'll leave the porch light on for you.